Friday, May 3, 9:15 a.m. – 5 p.m.
HAMILTON: THE EXHIBITION uses the unprecedented, and revolutionary storytelling techniques and music of Hamilton: An American Musical to delve deeper into the history of one of America’s once-forgotten founding fathers and the times in which he lived. Using original objects, period re-creations, rich scenography, theatrical lighting, sound and scent design, advanced audio-visual and multimedia techniques, and expertly-crafted music drawn from the Broadway production, the Exhibition will immerse visitors in an emotive and narrative-rich landscape that will bring to life the spirit of the American Revolution and Alexander Hamilton—the man behind the music. 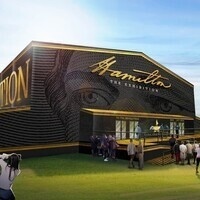 Sometimes mistaken as one of the country’s first Presidents and often overlooked for his miraculous body of work that helped shape the America we live in today, Alexander Hamilton will come out of the shadows through this one-of-a-kind experience. HAMILTON: THE EXHIBITION will help unpack that narrative in 20,000 square feet using the thrilling and poignant emotions elicited by creator Lin Manuel Miranda and his collaborators as its guide. Participants will depart from the Normal Road (east) entrance of the Holmes Student Center at 9:15 a.m., Friday, May 3, 2019. There is also an NIU Naperville pick-up option also at 9:45 a.m. We will return at approximately 5:00 p.m. to DeKalb. Matt Streb, NIU Chief of Staff and Political Science Professor and Mark Pietrowski, Director, NIU Continuing and Professional Education will lead a discussion about Hamilton on the bus ride and also provide some trivia questions for fans of Hamilton. The fee includes transportation, presentation on bus and a ticket to the museum. Lunch is on your own in Chicago after the exhibition which starts at 11:30 a.m. and takes approximately two hours. $69 per person for NIU employees, students, alumni and LLI members. $75 per person for regular rate. To register you can call 815-753-0277 M-F, 8 a.m. – 4:30 p.m. or register here online. We anticipate this event selling out fast so please register now if interested. $69 per person for NIU employees, students, alumni and LLI members. $75 per person for regular rate.